Location: Conveniently set in Bennett, Colorado. Just East of Denver off I-70 and Manila Road. 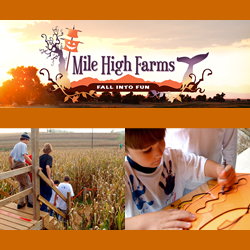 Mile High Farms is Denver’s newest and largest destination for Fall family fun. Attraction include: corn mazes full of activities, hay rides, a pumpkin patch, barrel rides, a petting zoo, and bouncers to name a few. Be prepared with sneakers or boots. It’s sandy out here and not open-toe-friendly.